Keep it QUIET Flexible Vinyl Cover Silences accidental contact with Gun or Bow Keep it READY Instead of keeping it in your pocket or bag Hang on a Tree Limb or Around your Neck Keep it STEALTH Hangs Upside down to eliminate unwanted sounds while entering the woods Don't Risk Hunting for your Flip Can Call in your bag or pocket when the crunch time is on... Keep it Quiet, Keep it Ready, and Keep it Stealth...Stealth Bleat!!! 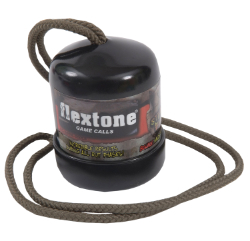 This call produces incredible results during all phases of the rut and works for calling Whitetail, Blacktail, and Mule Deer. It is simple to use, just flip it over two or three times to produce the estrus bleat and wait approximately 10-15 minutes between sequences. You can also use it in conjunction with the flextone Natural Grunter for even more impressive results.